One of eleven plates printed by William Dickes using the Baxter Process and used as an illustration in the book “A History of the British Sea-Anemones and Corals” by Philip Henry Gosse and published by Van Voorst in London in 1860. 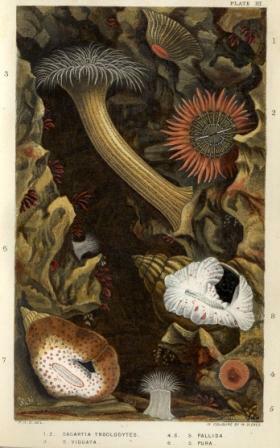 The plate shows various anemones etc. This print measures about 17.5 x 10.5 cm.